For my birthday (yes, I turn 43 today! ), I have been saving up one of my favorite pictures. 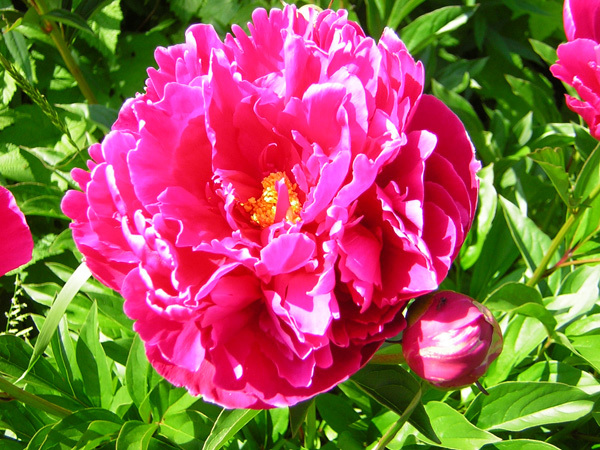 It is of an absolutely stunning peony that was growing in H’s cousin’s garden at her house in Lutsen. The color is just knock-your-socks-off, dontchathink? I’ve been enjoying your flowers, kinda jealously, since I’ve moved from a two-acre gardening paradise to a city condo. Thank you! It’s so luminous it appears to be radioactive. Boyd I am thouroughly enjoying your daily flower picture – such lovely blooms! With all my heart I am wishing you a wonderful birthday. See you soon…love Susan. Spectacular Boyd!!!! I have a bush just like this in my front yard and they were particularly profuse and spectacular this year. There’s something about this shade of deep magenta (and it happens with other rich reds too) that makes my digital photos luminescent like this too. GORGEOUS!